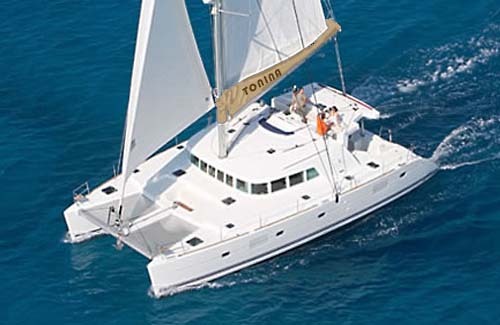 Luxury Sailing Catamaran Tonina is available for charter in the BVI’s of the Caribbean Sea. 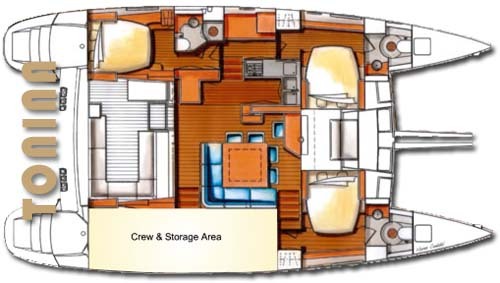 Tonina is a Lagoon 500 that accommodates up to six guests in three private staterooms all with individual air-conditioing, private ensuite bathrooms and ample storage space. 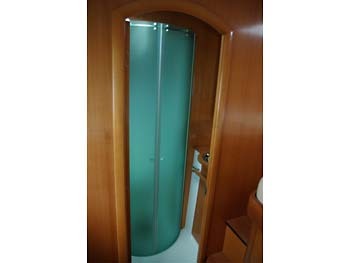 The cabins have plenty of hatches for natural ventilation and light and are spacious with plenty of head room. 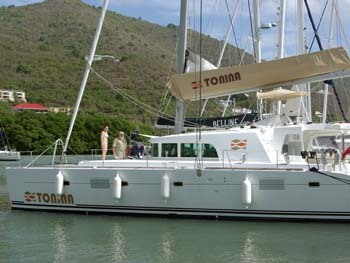 Tonina is the Carib word for dolphin and stands for freedom of spirit, elegance and passion for the sea. Her contemporary interior is light and modern and not overdone. The warm colors of the interior feel welcoming and luxurious and are a little different than one might expect. Every care has been taken to prepare this Tonina to be a cut above the rest. She has been fitted out with the best (and quietest) generators money can buy. 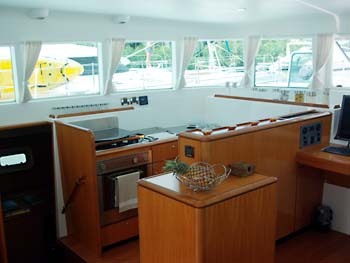 She has excellent water makers and all of the “behind the scenes equipment”, to ensure guest safety and comfort, is the first priority The gourmet galley has excellent appliances including a full size dishwasher which means the crew has more time to pamper their guests while on board. 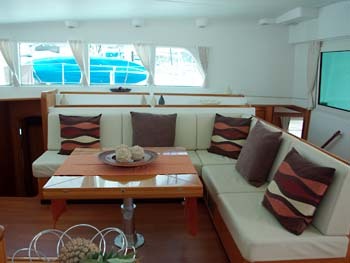 Luxury charter yacht, Tonina has a large spacious saloon with indoor dining and lounge area. 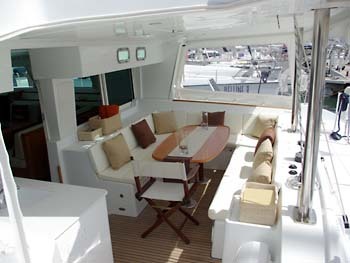 With a sliding door guests can step directly out to the cockpit which is covered by a hard top bimini and also offers alfresco dining and a wet bar with an ice maker so guests can help themselves to drinks. 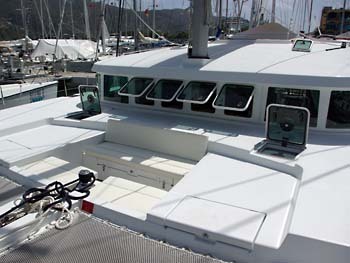 On top of the cockpit is the flybridge which has the helm station and seating for six. 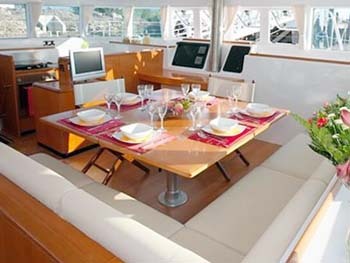 The ample foredeck offers another seating area (which can be shaded if guests prefer) and the trampolines which are perfect for sunning and stargazing of an evening. 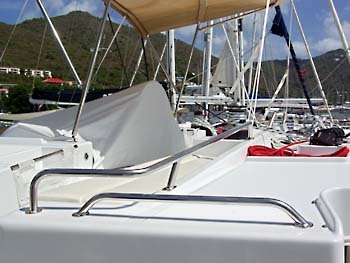 Luxury Catamran Tonina has a professional crew of two who are both excellent sailors, with years of experience cruising in Caribbean waters. 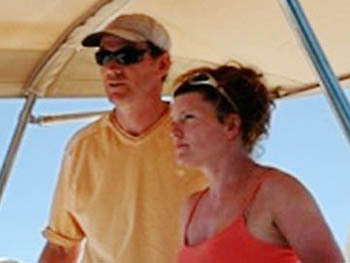 They are both excellent cooks and enjoy introducing their guests to the delights of the Virgin Islands and the joy and relaxation of sailing in the Caribbean Sea. 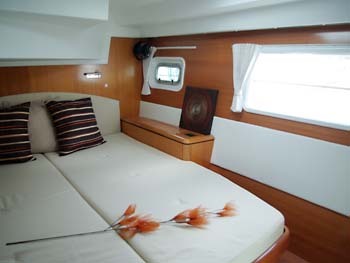 Luxury sailing yacht Tonina has three spacious staterooms available to guests and can accommodate up to 6 people. 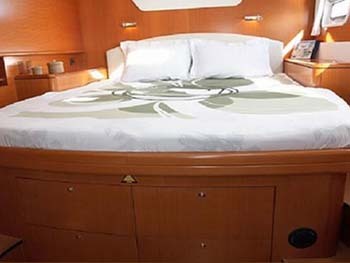 Her staterooms offer queen size island beds, ample storage space, private ensuite bathrooms and individually controlled air-conditioning. Her communal living areas include a huge salon area which offers interior dining as well as a lounge area for games or movies of an evening. 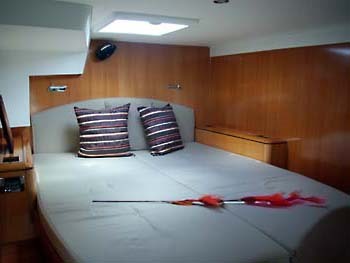 Her exterior living spaces include a cockpit with alfresco dining, lounges, a wet bar with ice maker and a hard top bimini to protect it from the weather. 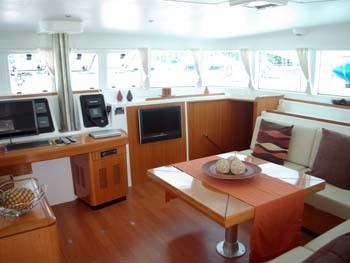 Tonina also has a flybridge with the helm station and seating for six. The fore deck offers plenty of space for lounging in the sun with lots of hard deck as well as the two trampolines and a sunken seating area that can be shaded if guests choose. AB RIB with 40hp outboard, Wake board, water skis, knee board & fun tube, 2 x 2 man kayaks, Full complement of snorkeling gear, Rendezvous diving, Swim platform & shower, Water maker - 25 gallons per hour, Wet bar in aft cockpit with guest fridge & ice maker, Sound system in salon and each guest cabin with access to digital music library.